Really, Austria was so great and there is so much to say, that you would fall asleep if I put it all in one post. So, I will stretch it out a bit. 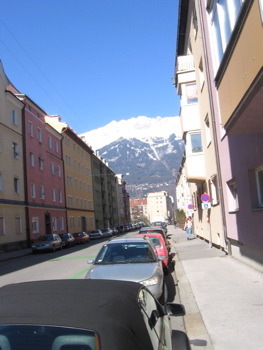 We will begin with the town in which we stayed: Innsbruck. It all started when Mark was a young boy skiing the world-famous Southern California slopes. He dreamt of moving to Europe and spending his days swooshing through the Alps. And so, since we are living in Europe, what better time to fulfill his boyhood dreams? We knew this trip would be the granddaddy of all vacations. I mean, think about it. Europe is expensive, Austria is expensive, and skiing is expensive. So, if you do the math, expensive+expensive+expensive=GRANDDADDY VACATION. We’ve sacrificed all year to save up, including no frivolous gifts and no buying anything that is not an absolute necessity. At first, Mark was indecisive as to whether we should ski the Swiss Alps or the Austrian Alps. But, based on snow reports extensive research he chose Austrian Alps. And you know we couldn’t just go to some podunk village. Oh no, my friends. We had to go to Innsbruck, the host of the 1964 Winter Olympics, because apparently in his boyhood dreams, Mark was also an Olympian. And people everywhere were riding bikes. 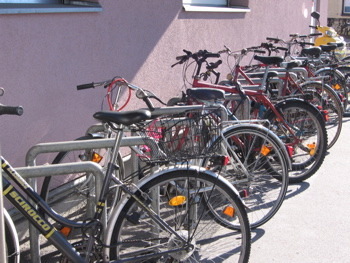 In fact, I think there were almost more bikes than cars. The first and last days we were there we spent our time cruising the town. It isn’t very big and all the action is right in the center, which was about a 15 minute walk from our hotel. Perhaps because it is in the mountains, or maybe because there are fewer cars, I don’t know exactly why, but the air felt clean and fresh. Anyways, it was pretty clear that Innsbruckians are proud of their town and take care of it. Since they love it, we decided we would, too. And we did! So much that I could barely leave it.